He wants to change the world; she wants to embrace it. Welcome to the world of the Victorian upper class: a vibrant, strictly ordered society that encourages gentle, intellectual pursuits but condemns those who reject its conventions. In a community created to celebrate the Arts, gothic novelist Geoffrey Hawes finds himself coerced into lecturing to the idle rich. Reluctant to abandon his solitude, he must concede or risk offending his wealthy patrons. Bitter and disenchanted with the privileged and wealthy, Geoffrey hides his scorn as best he can, but he refuses to let the social conventions of the time determine the course of his life. The last thing he expects to find in this rarefied world is someone who understands his unconventional views. Budding artist Miranda Claridge, the Governor’s intelligent and vivacious daughter, uses her unique perspective to open Geoffrey’s eyes to all that is beautiful and good in the world. Wise beyond her years, she is able to see beyond the trappings of society to the wonder of small, every day details, but unlike Geoffrey, she is unwilling to reject the conventional duties of rank and family. Her calm acceptance of her life’s predetermined path frustrates and bewilders the fiery, passionate Geoffrey, but she does not hesitate to challenge his beliefs with equal determination. In the midst of their many heated debates on the mores of the upper class, this unlikely friendship blossoms into a passionate, impossible love. Although Geoffrey does not deny his longing for Miranda, he cannot convince her to abandon what she believes to be right. In order to win her, he will have to sacrifice his own pride and convictions. To find a solution, they must discover where their true destinies lie. In a battle between principles and passion, can there be a victor? Frustrated, Geoffrey left the assembly and returned to his lodgings. He gravitated once more to his balcony, gulping in great gusts of air in an attempt to clear his head. Now that he was away from Miranda Claridge’s intoxicating presence, he searched for some rational thought that would rid him of this impossible infatuation. It proved to be a futile effort. When at last he conceded defeat, he saw that each interaction with her had but served to increase the strength of the unbearable yearning, and that the kindest course of action to take for himself would be to remove himself from her presence altogether. However, the next day he discovered that the temptation to see her once more was too great to resist, and he found himself standing in the Claridges’ well-appointed home before many more hours had passed. A drink had been pressed into his palm, and he gripped it like an anchor while he watched Miranda’s elegant figure float into the room. She wound her way through the throng with practiced ease, smiling and dispensing the appropriate welcoming sentiments to her parents’ guests. He suspected that the words falling from her lips with such aplomb were insincere at times, knowing as he did the personalities to whom they were addressed, but no indication of her personal opinions was revealed by that smooth mask. She was beautiful and alluring, it was true. But he hated to see her like this. The light in her eyes was dimmed, almost unperceivable, and her gentle smile was too restrained, allowing no hint of unladylike wit to mar the smooth lines of her face. Even as he winced at this façade she had assumed, he found that he could not look away. He watched her progress while she moved in his direction. So absolute was his focus on his inward struggle, so lost was he in the dark byways of his conflicted mind, that when at last she made her way to his side, he was startled to find her there before him. Recalling himself, he met her frank appraisal with a frown. “It was good of you to come,” she said, her voice ringing with the cultured timbre that had been bred into the members of their class. “I did not wish to disappoint you,” he replied in a bitter tone. There is no doubt in my mind that Ms. Lawrence can pull off a historical romance with flair and grace, and she delivered a wonderful period piece, surpassing my expectations. I fell in love with period stories when I was younger and that love stayed with me, so when I was given the opportunity to read this novel, I jumped at the chance. I have always been somewhat wary about how well an author could pull off a period story, but that was not the case with this author. From the first page, I was drawn into the story and at many points in the book, I felt as though I was actually with the characters. That’s a rare thing for me and it goes to show how extremely talented and hardworking this author is. Everything down to the finer details were spot on and not once did I feel as though there were any errors in the timing or language of the book. The characters, Miranda and Geoffrey, were very easy to relate to and I think they will be the couple that will stay with me for a very long time and I will happily re-read this book over the coming years. As a self-proclaimed bibliophile, I’ve always enjoyed a variety of books. In my lifetime, I’ve read, and enjoyed mind you, many of the greats: Shakespeare, Poe, D. H. Lawrence, Austen, and Hawthorne, to name a few. Dickens was always a little tedious for me, to be honest. Of course, I’ve enjoyed the more modern writers such as King, Stephen Donaldson, Diana Gabaldon, and Anne Rice, as well. The point I’m trying to make is that I have an appreciation for the written word, and when I sat down with Elizabeth Lawrence’s The Truth Seekers, it didn’t take long to realize another great was in my hands. While the hero’s point of view is common enough in modern day romances, it was not the norm for that period in history. I googled it; because I started second guessing myself! What a bold and brilliant move by Lawrence. From the first page the reader is sucked into Geoffrey’s head; we get to experience all the turmoil of his forward thinking beliefs (always the way with eccentric novelists) and how they almost become his downfall. Through his eyes, Miranda Claridge is seen much like a morning glory: so fragile, yet so full of life and glorious as she opens to the possibilities each new day brings, then withering and closing under the extreme heat of the afternoon, i.e. Society. I could continue to elucidate how wonderful this novel is. Allow me, instead, to suggest that if you have even the slightest fondness for a well-told romance that will leave you guessing until the end if the ‘guy gets the girl,’ then don’t wait. 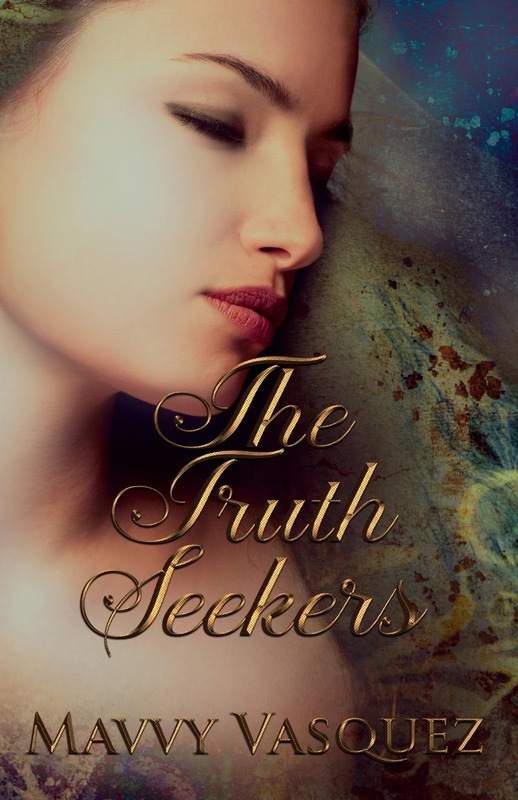 The Truth Seekers is a modern day masterpiece which will win you over faster than a suitor come calling, and one that I will proudly display next to my cherished copies of Wuthering Heights, Jane Eyre, and The Stand. Mavvy Vasquez is an author of contemporary and period fiction. Also published under the pseudonym Elizabeth M. Lawrence, Ms. Vasquez enjoys weaving together different genres to explore and examine human relationships and dynamics. A lifelong writer and artist, Ms. Vasquez divides her free time between her husband, two sons, three cats, her collection of cozy murder mysteries, and her mildly severe caffeine addiction. Her eclectic background includes intellectual property law, ghosts, ball bearings, opera, government proposals, fabrics, and framing. A native of Lawrence, Kansas, and graduate of Allegheny College in Pennsylvania, she now works from her home in Cleveland, Ohio.